The most extensive alpine zone in the eastern United States is in the White Mountains. I’d say that we knew this before our recent hike up to Mt. Lafayette, but not exactly. I’d pointed out to Ursula and Virgil the line between forest and treeless slopes on Mt. Washington, the Presidential Range, and Franconia Ridge from plenty of vantage points down low. But the hike to Greenleaf Hut, below Mt. Lafayette, gave them their first real chance to stand above treeline in New England. On our hike up to the hut, Jim introduced Ursula and Virgil to one of the best words in the White Mountains: krummholz. This German word does some poetic justice to the stunted, twisted, tough balsam forests that mark the boundary of the alpine zone. It took joining a talk by Brian Fitzgerald, the naturalist at Greenleaf Hut, however, for me to make a deeper connection between being above treeline and the alpine zone. Fitzgerald, a recent graduate of the University of New Hampshire, explained that the alpine zone in the White Mountains is the remnant of a tundra ecosystem that existed after the last glaciers retreated in what is now northern New England. As the climate warmed, the plants and animals of the tundra retreated to higher elevations. They’ve existed in the zone above 4,500 feet for the past 10,000 years. Plants in the alpine zone have adapted to its harsh conditions, Fitzgerald explained, by growing in tight clumps close to the ground, like pincushions. It may take a plant up to 8 years to gather enough energy to produce a single flower, and decades to cover a patch of ground as big as a footprint. He passed around photos of plants that grow in the alpine zone, including diapensia, whose five-petaled white flowers we’d see the next day on our walk up Mt. 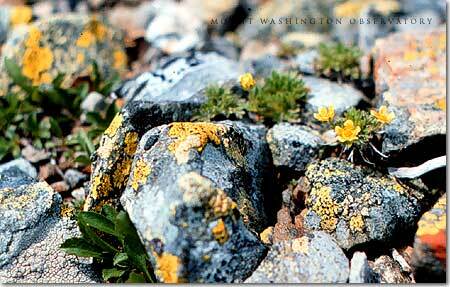 Lafayette, and dwarf cinquefoil, a federally endangered plant that grows only on Mt. Washington and Mt. Lafayette. We didn’t see that tiny plant, or its ¼-inch yellow flowers, but I gained a new appreciation for the fragile beauty of all plants in the alpine zone. Fitzgerald also tells them that plants in the alpine zone don’t have any options if the climate continues to warm. “It would be a real loss” if kids could no longer hike up to a high hut and see a small bit of the arctic. Photo from Mount Washington Observatory: Dwarf Cinquefoil (Potentilla Robbinsiana), is federally protected and is the rarest alpine plant in New England; found only on Mount Washington and the Franconia Range. The plant appears to grow out from under the rocks. Bryan Yeaton Photo.